For each story or series, I start a binder. Critique notes from my CPs, beat sheets, character background info, etc. all go into the binder. Each story/series also gets its own notebook. I divide it into two sections: one for notes I take on read-throughs, the second for a character voice journal. And that’s it. Admittedly, it’s a simple system, but so far it works. I recently felt overwhelmed with a series I was working on, so I’m starting to realize I need some way to keep notes on a series organized. A section in the binder? I have a series outline, so that’s a start. But I know I need more; I’m just not sure what yet. Suggestions would be appreciated. What about you? How do you keep your stories organized? Writing: So far this week I’ve written 1,131 words in “A Prince in Patience Point” (formerly “Be True”). Thanks to Amelia Ross for recommending the shiny new title. 🙂 I’ve set The Cabot Sisters series aside for now because it turns out that my brain can’t handle working on a series and teaching a new class at the same time. I was changing things in one book, and then working on another and forgetting that I’d changed them, etc. So I’ve switched back to Abbey and Neal’s story for the time being. Reading: Just finished reading “Beautiful Demons” by Sarra Cannon. Not sure what I’ll read next. A month or so ago I started reading “The 10th Kingdom” by Kathryn Wesley, so maybe I’ll finish that one. What about you? What are you currently working on? Do you have any recommendations for authors working on a series to keep everything organized? My organizational system is “HAHAHAHAHA” (as in a joke). I have stuff to organize my writing before I start it. The skeleton for the pre-writing stuff is on Ever Note. Most of what I fill is in a Word doc, but some is on a Google Drive spreadsheet. Then, when I edit, there are sticky notes, notebooks, and doc highlighting marks…. I really need a system! I’m surprised I’ve managed this long with the mess. I am currently back to editing ALCHEMY. Though, I’m doing the pre-writing for a new series (a superhero soap opera… too many comics and binge watching ONCE UPON A TIME got to me). I hope to start that at the end of the month. Good luck editing Alchemy. And a superhero soap opera sounds wonderful. Can’t wait to read it! I keep a notebook on each story as well. I have a planning section which is character sheets and plot flowcharts (outline) and then any notes or research. At the end I have the story and critiques. It’s not a great system but it works for the moment. I’m always looking on ways to improve it. I currently use folders for each story – one for my writing (I write pen to paper, then type) and a folder for research. 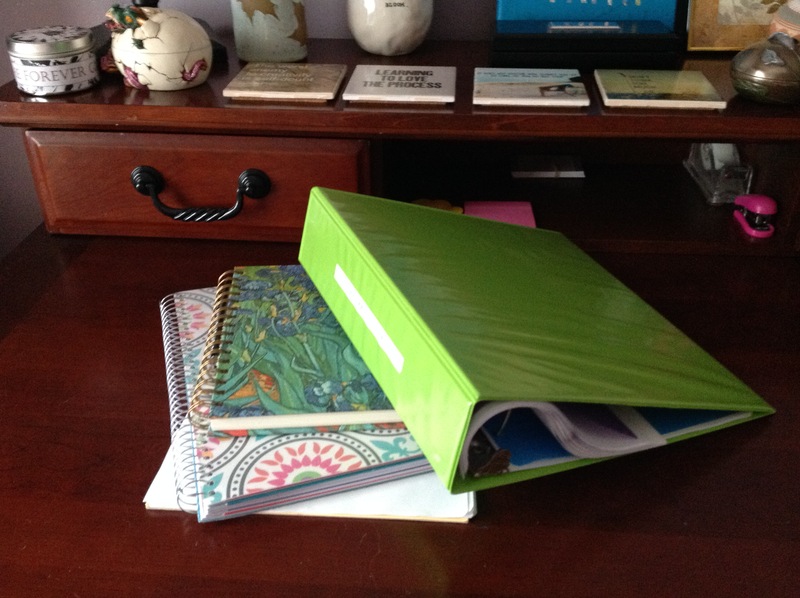 Really like your idea of using a binder to keep all the pieces separate yet together. Yeah, the binder comes in handy, especially when it comes to organizing my critique notes. Folders work pretty well, too. Most of the binders I use have pockets, so I tend to use those a lot. Thanks for the peek into your process! I love this stuff. I am in the middle of changing up how I write and organize because what I was doing before (Evernote notebook plus a folder in my Documents plus a notebook) wasn’t working well. I’m not entirely sure what I want to experiment with, although I know it will involve digital and analog components because I am never comfortable with just one of those. Me too. I’m always curious to learn about other writers’ processes. At the end of the day we have to find the system that works best for us as individuals, but it’s great to learn and share. I like that you’re trying to combine digital and hard copies. My binders tend to contain a lot of documents that I also have electronically, so in a way, my system is similar. Good luck finding one that works for you! I have everything organized into files on my computer. For my plotting notes, I have expandable folders, with one section for each story. Once I publish one, I get rid of those notes to make room for the others. Yeah. The ability to organize files into folders on my laptop keeps me sane. I have a main folder for each story, then separate folders within each folder for character background, blurbs and synopses, and older drafts/excerpts. So far, that system works. Gads! I think you hit the mother lode here. How do writers keep their stories organized without getting bogged down or lost??? Thank you for summarizing your process and laying down a challenge. I will summarize my process as well, for the first step in change in recognizing where you are. Since I write historical fiction, the research seems formidable at times, for my process is not just about the story. I think clutter might be the operative word! Good progress on writing for you this week. I’m still sorting through all this new research. Finished reading Jackson’s Children of the Fur Trade. What’s next? I’ll go to work on process. Yes, the topic seems to have resonated. I think organization for writers (okay, maybe for anybody) is an ongoing process. I know that even outside my writing, just in my home, I’m constantly fighting clutter and trying to find a place for everything. I suppose our writing lives are no different. Good luck with your WIP(s) and happy writing, Beth! Yeah, if it weren’t for my notebooks and binders, I’d be completely overwhelmed. This system does allow me to transition much more smoothly between WIPs. What kind of tablet(s) do you use? I use Evernote to organize my stories. I have a “notebook” for all stories. In each notebook are character profiles, plot outlines, and any item I use for research. I will write out my drafts before typing to get a feel for how my story will play out. Admittedly, this isn’t necessarily good because I have stories that are incomplete mixed in with stories that are. It would make more sense to type them out and save them under different files and revisions. It’s been a long time since I’ve handwritten a scene. I so admire people who hand write their stories. I make too many line changes when I write to hand write. I’d go through a large eraser with every draft! Okay, so I haven’t used Evernote but I hear lots of people mentioning it. Maybe I should try it!